What a BEAUTIFUL , relevant post, Gerardine. You did such a graceful and marvelous job. love this so much! love you more. Too many people think if they don’t look straight at a problem it will go away. It never does it only gets worse. Gerardine, are you not joining us for the Rally? Which Rally? Sorry brain went to sleep, I added my name to Jingles Blog. Thanks for reminding me. Thank you! I love your comments. 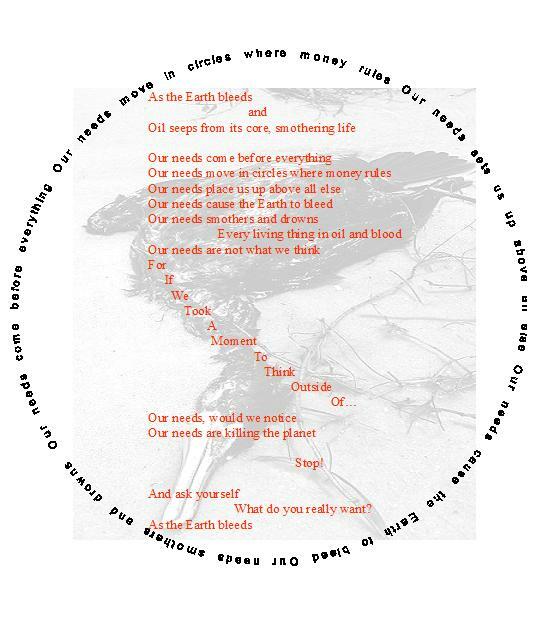 what a beautiful poem about the global issues we have..thanks for sharing! 😀 great poem! Your poem: Powerful message and attractive form. Excellent message and most apt at this time. I also like the visual aspect. Clever. I just wish I could do something more. When will we learn it? After how many more deaths? fantastic poem and priceless message. But will anyone listen? Thank you for commenting . Very poignant, I love how you have placed your words, slowing the reader down. I wanted the poem read slower I am glad you spotted that. Thank you for your comments. Wow!.. The poem is very powerful, even the layout does wonders to the impact, good job! Wow! Amazing. I liked how you managed it in the globe picture. I really like this poem. So apropos with all that’s going on. Beautifully done!